One for the travel bucket list, then. Aurora 2012 from Christian Mülhauser on Vimeo. Northern Lights Trippin from Rave Dave on Vimeo. This entry was posted in TRAVEL and tagged travel, video on January 28, 2016 by Mary Joy. Munich was the third stop in the Bavarian tour. I had been here on a day trip years ago, to see Albrecht Dürer’s Portrait of the Artist as a Young Man in the Alte Pinakothek. This time around, I had lots of time to wander. 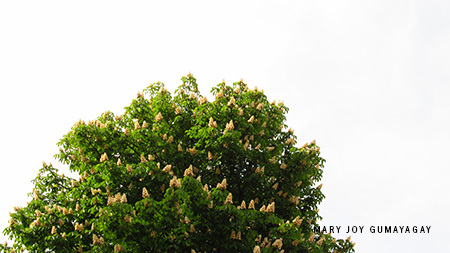 Spring is a glorious time; leaves are sprouting and sometimes there are early flowers, like these on a chestnut tree in the Viktualienmarkt. 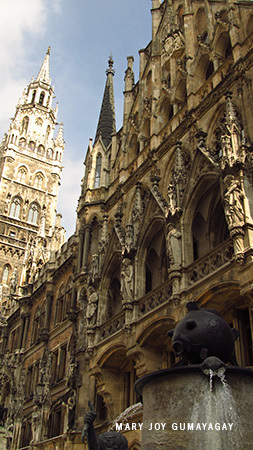 The apartment was just a few steps away from the market and the Marienplatz. Given that I had only a few days, I decided to concentrate on the Innen Altstadt (the city center). (Next time the BMW Factory Tour!) In the morning, the interplay of light and shadow among the many spires and statues and gargoyles of the Neues Rathaus (New Town Hall) is absolutely beautiful. A Glockenspiel captivated the plaza with its animation, and a street performer entertained a friend with stories of rich Saudi Arabians in the summertime. 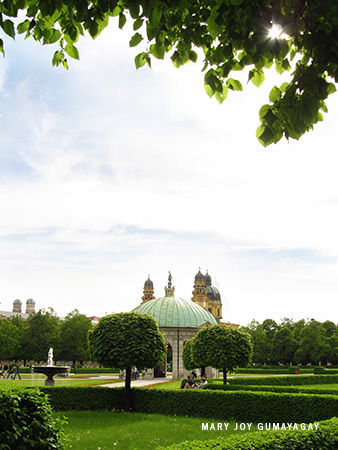 The Odeonsplatz is another big square, a popular meeting place for tourists, tour groups, and locals alike. A Baroque cathedral, the Theatinerkiche just to the right of the Feldherrenhalle (Field Marshall Hall) was another main attraction. Directly across the Odeonsplatz was the Hofgarten, a large square that on this sunny day was the perfect location for painting (and dozing on the grass). I arranged to meet my friend Adriana, who has lived in Munich for 8 years now. Her German is excellent, to my ears at least! (Here’s a picture of us in Twist Collective’s blog; unfortunately my mouth was filled with macaron, lol.) We took the tram to Strickeria, where we put our (knit) finishing skills to use. A bit of back story: Football club Bayern München had won the national championship and were set to play Dortmund Borussia for the Champions League title. 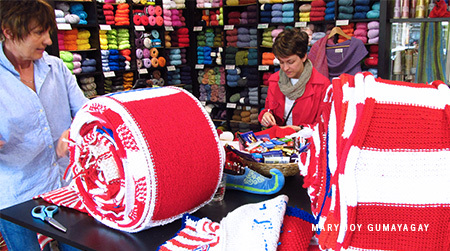 Local radio station Bayern 3 sent out a call for knitted squares—red and white—to be sent in to create the “World’s Longest Fan Scarf”. Boxes and boxes of the squares were then brought over to Strickeria, and we happened to be there when Bayern 3 filmed one of their segments. We set to work; at the time there were three massive rolls of knitted scarf and the deadline loomed: threee days to go! Pathetic me only managed to finish a meter-long segment; the resulting scarf was 1.6 kilometers long! Special thanks to Adriana for guiding us all over town on such short notice, and for feeding my fabric and yarn stash! More photos can be found in 2013 München. 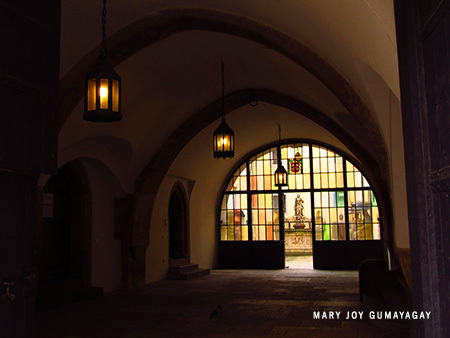 This entry was posted in Germany and tagged 2013, Europe, Germany, travel on June 22, 2013 by Mary Joy. Pretty, pretty Regensburg! Like most European cities, it’s meant for walking. A lot of walking, but there was so much to look at, and take photos of (buildings and inhabitants both). We crossed the Steinernen Brücke and found this view on Stadtamhof, away from the crowds. There was a perfect spot to nap in the sun. Light filters through colored glass windows, offering a peek into the Justice Courtyard. There were many such nooks and crannies in the city. At the Haidplatz, people (and dog) watching. 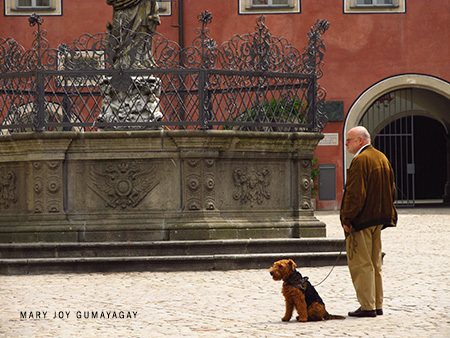 I adore such well-mannered European doggies! Interior of Basilika Sanktemmeram. 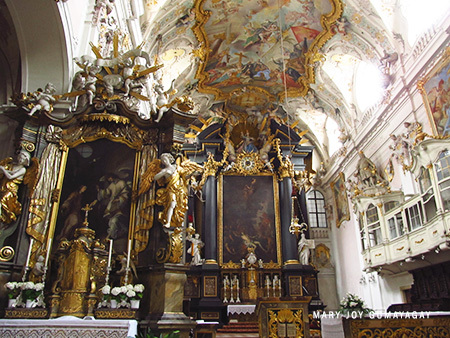 Once again, fabulously in all its golden Baroque glory. 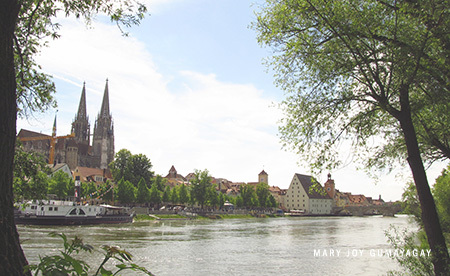 The city of Regensburg, located between Nürnberg and München on the Donau river, is filled with great history. Bavarian tribes lived in what would become the Roman Empire’s northernmost legionary camp, Castra Regina, under Marcus Aurelius. It was at one point Charlemagne’s seat of power, and its prime location on the major waterway between Eastern and Western made Regensburg the axis of travel to and from all parts of Europe. Wood huts gave way to stone buildings during the Middle Ages, most of which were preserved. Regensburg is also home to the Princes of Thurn und Taxis (founders of the modern postal system). Centuries of decline followed, ending briefly with the founding of the Messerschmidt factory during WWII, and permanently with the founding of the university in 1967. 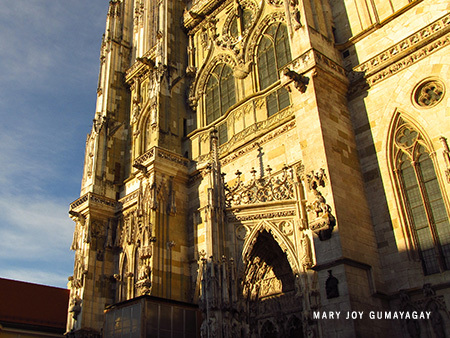 More photos can be found in 2013 Regensburg. 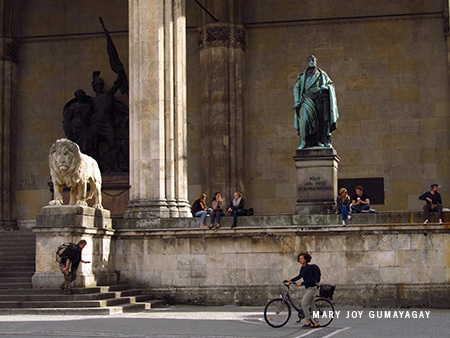 This entry was posted in Germany and tagged 2013, Germany, travel on May 27, 2013 by Mary Joy.